Having a beautiful commercial kitchen can provide you with a lovely working space and a safe and sanitary environment for your employees. No one wants to work in a kitchen where the floor is chipped or where the laminate is coming apart. Not only will this lower the morale of your employees but it will also cause concerns for your health inspections. Even if your customers are never in the kitchen, you still want this area to look brand new. 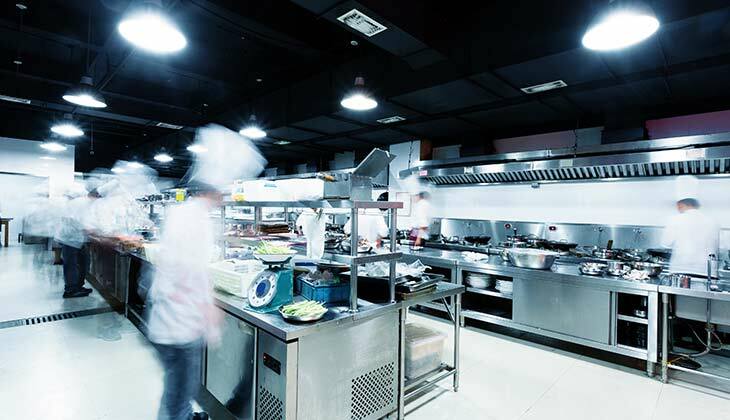 Take the time to compare different surface coatings designed for commercial kitchens. At Polytek Surface Coatings we offer a wide range of options of coatings and colors. Find your perfect fit by browsing through our website or contacting our team today for a free estimate. Whether you are looking into buying a commercial area for a new restaurant or are looking to upgrade your current restaurant with a new kitchen floor, Polytek Surface Coatings can help. We provide commercial floor coatings for all commercial areas including kitchens, restaurants, public washrooms and many other public areas. From small coffee shops to banquet halls, we can help. Then Polytek Surface Coatings can certainly help! Whether it is the kitchen in your house or the kitchen in your restaurant, only the best will do. Let us help you with the design and installation of your new flooring. Our state of the art computer systems can help you decide the perfect coating for your kitchen that complements your space and provides maximum protection from every day wear and tear as well as chipping, cracking and peeling. PolyTek Surface Coatings offers a five year warranty on all commercial surface applications so you can be sure that your flooring will last. You can expect your concrete coating to remain in excellent as new condition for many years to come.